Through a small break in the trees you can see it, but just barely. You charge ahead toward the gleaming silver tower squarely mounted at the summit of the trail. It’s what you climbed the mountain for. It’s what everyone climbed the mountain for. At the destination, you crane your neck skyward and take in the 35 feet of steel. Five flights of stairs zigzag upward, encased in metal caging to prevent hikers from teetering on the wooden stairs and tumbling over the slim banisters. Giddiness and anticipation make you dizzy. The stairs beg you to climb them. With each step, the ground feels exponentially farther away. The wind wails, flapping your pants like a flag in a storm. You know you can’t possibly be pitched from the tower, but you still feel unsteady. The tower’s cab can’t come soon enough. Finally, its open hatch comes into view. Heeding the handwritten reminder to watch your head, you duck and enter. Immediately the air is calm; the cab’s windows are closed against the wind. The panorama is breathtaking. You imagine what it must have been like for the tower’s earliest inhabitants — grizzled fire observers trained to spot smoke in the hills — to be surrounded by so much beauty. Sure, the hike up to this point was fun, but this is what you came for. And so it goes with the 23 Adirondack peaks that claim public fire towers. While the 6-million-acre park offers innumerable hikes up and around its many summits, only a handful of those peaks can claim to be fire-tower mountains. 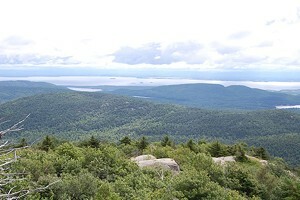 That number could decrease in the near future, pending the result of a dispute over the towers on two of the peaks — Hurricane Mountain and St. Regis Mountain. Regardless of the outcome, people’s love of Adirondack fire towers — for their mystique, their views and their history — is incontrovertible. The New York Department of Environmental Conservation (DEC) began erecting fire observation stations on the park’s summits after forest fires in 1903 and 1908 destroyed nearly a million acres of Adirondack woods. The first such station was built atop the 2180-foot Poke-O-Moonshine in 1912. Five years later, the state replaced the original station on the peak with a standardized steel tower. Unlike western forests, which tend to be much drier and more fire prone than their northern cousins, the Adirondacks were historically considered “asbestos forests,” says David Thomas-Train, president of the Friends of Poke-O-Moonshine. But droughts, irresponsible logging practices and sparks from the locomotives that soon cut through the park made its woods more vulnerable. State officials realized that, to preserve and protect the region, they required some sort of warning system. The fire observation program was born. “The installation of the towers marked the first state effort at land stewardship,” Thomas-Train says. Over the years, the state built 57 towers within today’s Adirondack Park. Civilian fire observers and forest rangers manned them for six to seven months of the year, living in cabins on their assigned mountains and using jeep roads for vehicle access. When observers spotted smoke, they would use an Osborne Fire Finder — an alidade-type sighting device attached to a round map table — to find the rough coordinates of the fire. They would then triangulate with two other towers to pinpoint its location. By 1985, the state determined the fire towers and their unionized staff were too expensive and opted for aerial surveillance. The towers were all decommissioned by 1989. Today, the use of light aircraft to spot fires has become outmoded, too. The need for aerial surveillance within the Blue Line “has been obviated by hikers with cellphones,” says Thomas-Train. Steven Engelhart is executive director of Adirondack Architectural Heritage, a nonprofit historic preservation organization. He argues that, when it decommissioned the towers, New York lost a piece of Adirondack history. The fire towers were an emblem of the public’s willingness to care for a natural resource, he says. The humanmade steel structures are part of the regional vernacular. Today, 34 towers exist in the park — 20 in the Forest Preserve and 14 on municipal or private land — but not all are accessible. Some, like the tower atop Hurricane Mountain, have been closed to hikers pending necessary restoration. So far, 11 towers have been restored. Work on Poke-O-Moonshine, which Engelhart considers one of the park’s “success stories,” began in 1997. With funds raised by volunteers, the wooden steps were replaced, as were the steel crosspieces. The group installed safety fencing and new windows to keep the weather out, and commissioned the building of a new map table and brass alidade. Inside the 7-by-7-foot cab, volunteers placed interpretive panels that detail the viewscape and explain the tower’s role in Adirondack firefighting. The tower was reopened in 2005. In the early days of Poke-O-Moonshine’s restoration, says Thomas-Train, vandalism was rampant in the tower. The alidade was stolen and the walls were spray painted. The problem has tailed off thanks to SUNY Potsdam students who serve as summertime stewards, as well as an increase in public education. Today, the fire towers have become one of the more popular hiking destinations in the Adirondacks, says Adirondack Mountain Club (ADK) spokesperson Paul Ertelt. Many of the mountains lack a significant view, and only from the fire towers can hikers get the perspective they’re looking for. People plan their hikes around fire towers, Ertelt says. 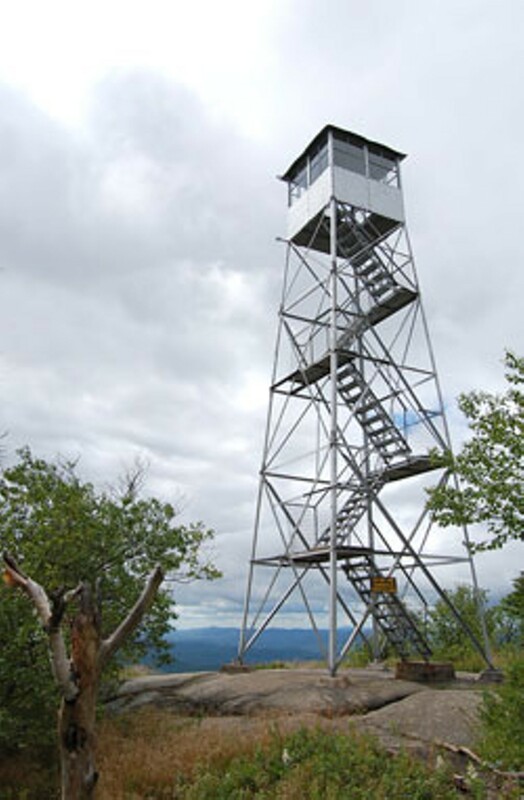 One of the club’s chapters sponsors a Fire Tower Challenge wherein hikers must climb and document at least 23 fire tower ascents — 18 of the 23 Adirondack Park summits and all five of those in the Catskill Park. The ADK supports this recommendation, but many other organizations — Engelhart’s and Thomas-Train’s, for example — do not. ADK’s board of directors voted in 2005 to oppose any changes to the Adirondack Park Agency’s Master Plan that would allow the nonconforming towers to remain. “It defeats the purpose of ‘wilderness’ if you see the works of man,” Ertelt says. However, after a number of local groups voiced opposition to the proposed removal, the park agency began looking at legal ways to preserve those two towers. ADK does not support this reexamination, says Ertelt. Ertelt does concede that, if the towers are removed, they should not end up in the scrap pile as many others have. Ideally, he says, they would be relocated like those reassembled at the Adirondack Center, the Adirondack Museum and the Ranger School at Wanakena. While fire towers might have raised some political hackles, the structures’ impact on the region is undeniable. On some of the more heavily trafficked fire tower mountains, such as Blue, Hadley and Rondaxe (Bald), which get nearly 50,000 visitors a year, hikers have to wait in line for a glimpse from the cab. There is something awe inspiring, even playful, about the towers. The structures and the views they provide instill a pre-digital-age sense of wonderment. Engelhart likens them to lighthouses. Want to climb the fire towers? While hikers can climb to these fire towers, not all of them are open to climb up.